With free, powerful 3D modeling applications like Blender Blender - A Powerful Free Cross-Platform 3D Content Creation Suite Blender - A Powerful Free Cross-Platform 3D Content Creation Suite Completely free, and a tool that has dozens of applications allowing you to try your hand at the challenging world of computer-generated artwork. Did I mention it's free? Read More and SketchUp Design & Build 3D Virtual Buildings & Objects With Google SketchUp Design & Build 3D Virtual Buildings & Objects With Google SketchUp Google SketchUp is the backbone modeling program for Google BuildingMaker, which allows graphic designers to submit building designs to Google to be added to the official Google Earth imagery. 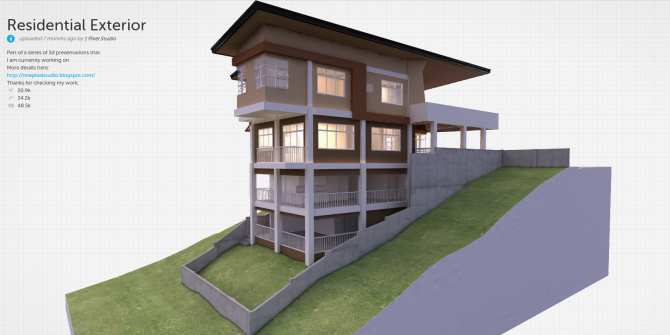 Read More , creating high-quality 3D models is more affordable and doable than ever before. Judging by the comments to my interview with Rafael Grassetti How A Dream Job Comes True: Interviewing World-Class 3D Artist Rafael Grassetti How A Dream Job Comes True: Interviewing World-Class 3D Artist Rafael Grassetti It's not every day that I get to pick the brain of a world-leading 3D artist -- but that's exactly what I got to do with Rafael Grassetti. You may not recognize Rafael's name, but... Read More , there’s lot of interest in creating models and working in 3D. Sharing those models with others, however, remains tricky. SketchUp has its 3D Warehouse where users can share models, but the warehouse requires you to log in — and you must share the actual model, rather than a 3D render of it. Sketchfab is an interesting service that tries to solve this, by letting you upload 3D models and embed them in beautifully rendered form anywhere on the Web. No plug-ins are required to view your embedded models: Just HTML5. Even if you’re not a 3D designer, the Sketchfab website is a beautiful repository of inspiring designs, and is fun to just cruise around in. You can rotate the model with your mouse, zoom in, pan around, and generally experience The Rock in full 3D. Note the reflections, the textures, and the various dings and scratches. Of course, putting all of these details into the model is the designer’s role — but it’s nice to see that none of the fidelity is lost when displaying the model using Sketchfab’s viewer. This is interesting, because it reveals that this impressive-looking model actually has a pretty low polygon count (a low-poly model, in other words). It’s like getting to peek behind the scenes of the model, because you can see where the actual modelling ends and the work of detailing surface textures begins. With First Person View enabled, you can fluidly move through the model using your mouse and your keyboard’s arrow keys. It doesn’t feel like a first-person shooter, but it is an effective way of getting around an apartment or house model. Clicking the Embed button pops open a simple dialog with an iframe embed code, a snippet of bbCode (used for forums), and just a plain link. Why the link should should be a level-3 heading (h3), I have no idea. The other embed options are clear and simple to use, missing only the option to tweak the iframe viewer’s dimensions. I have a keen interest in everything 3D, and I don’t recall seeing another service quite like Sketchfab. Being able to experience a 3D model in such a detailed way without having to install or download anything certainly makes 3D more accessible and fun. It could be a great fit for a woodworking blog to showcase their designs, and of course, for the portfolio of any 3D designer. Did you find any cool models on the service? Share them in the comments below! Here is another site which allows you to do this. Are you also show casing other free 3D applications? Google Chrome has free applications within its browser for floor plans (http://floorplanner.com/) and floor plan creator (http://planmieszkania.pl/) that do not cost a thing for a simple design. Another one is House Floor Plans (http://www.homestyler.com/designer). "Would you like to do some 3D modeling without downloading any bulky and expensive programs? Sketchfab makes it happen." Which would insinuate that SketchFab is some kind of modelling software when it isn't. In fact there's absolutely no modeling tools whatsoever, this is just a service to showcase your work. Shame on you MakeUseOf.